National Gandhi Museum, dedicated to Mahatma Gandhi, has a long story behind its establishment. The work on this museum started in Mumbai soon after the assassination of Mahatma Gandhi on 30th January 1948. Efforts were made to collect all the personal belongings of Mahatma Gandhi including personal relics, manuscripts, books, journals, documents, photographs, audio-visual material and anything that related to the life, philosophy and work of Gandhiji. Around early 1951, the work shifted to Delhi, with the museum first being set up in the Government hutments adjacent to the Kota House. Afterwards, Delhi National Gandhi Museum was shifted in 1957 the old mansion at 5, Mansingh Road and finally, in 1959, to the place where it now stands. Situated opposite Rajghat, this two-story museum was inaugurated on January 30, 1961 by the then President of India, Dr. Rajendra Prasad. 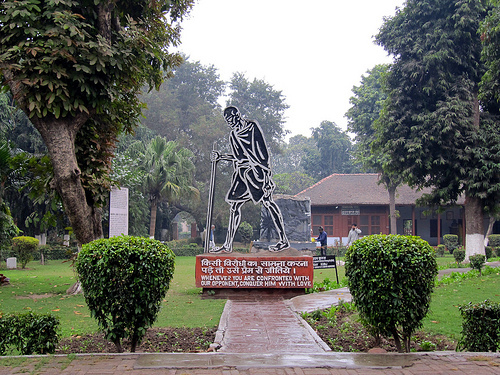 Also known as 'Gandhi Memorial Museum of Delhi, it comprises of five pavilions consisting of sculpture, photographs and paintings of Gandhiji, history of Satyagraha movement, along with the philosophy of 'ahimsa' (non-violence). Other collections of the museum include a stone bowl, a brass plate, the clothes Gandhiji was wearing on the day of his assassination, his wooden sandals, etc. National Gandhi Museum also houses a library and an information center.